By Graham Vanbergen: Amongst all the headlines predicting Theresa May’s demise somewhere between tomorrow and the Tory party conference and possibly a month or so beyond, and there have been many, why is the Evening Standard headline by far the most important? None of this is new information. Most people are speculating that Theresa May’s chances of survival as PM is at best slim. However, it’s the link with Citigroup and their biggest shareholder that is telling. How about this from America’s New Republic Magazine last October when Wikileaks were in full swing prior to the election that led to Donald Trump’s rise to the Oval Office. This was October 6. The election was November 4 2008. And yet Froman, an executive at Citigroup, which would ultimately become the recipient of the largest bailout from the federal government during the financial crisis, had mapped out virtually the entire Obama cabinet, a month before votes were even counted. Citigroup is the 4th largest bank in America – part of the ‘big four’. It has been implicated and fined for numerous illegal activities including involvement in the collapse of Enron, Worldcom and Global Crossing – to name just three of many. It has been fined for money laundering, conflict of interest, stock manipulation, violating federal security laws, misleading investors and non-stop scandals over the years including allegations of theft from its own customer accounts. So, Citigroup is literally ‘too big to fail or jail’ – it is in the know and at the heart of ‘the establishment’ – over there. Back in Britain Citigroup said: “In our view, May’s premiership is not sustainable beyond a few months, perhaps a year at most, and will be under pressure in the face of contentious parliamentary votes from the very beginning,” said the bank’s chief political analyst Tina Fordham in the note. But – George Osborne – ex Chancellor of the Exchequer is now the editor of the London Evening Standard where this article was published. 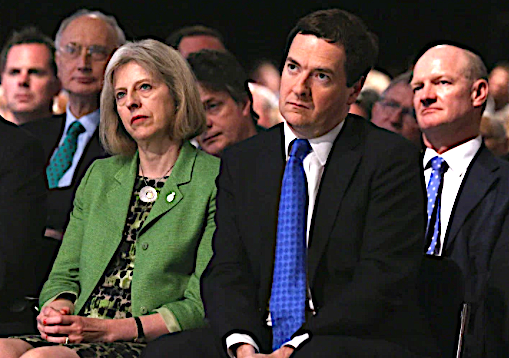 Other than being being a little mischeivious why would Osborne know any more than anyone else? A few months after being sacked by Theresa May, Osborne’s fees from US appearances in America’s Wall Street during the autumn topped £600,000, including £85,396.24 from Citibank for two speeches. In addition Osborne then took on a lucrative six-figure role as an adviser to BlackRock, the world’s biggest fund manager. Blackrock and Citigroup have serious business ties. According to the NASDAQ the largest institutional stakeholders in Citigroup are bond giant BlackRock. Blackrock has more money and assets under management than any company in the world and is in fact larger than the largest bank in the world. Due to its power, Blackrock has been called the world’s largest shadow bank. So, as insiders go, George Osborne, Citigroup and Blackrock should know what is going on as they are at the political heart of London; so if they say Theresa May is leaving, she’s leaving. You can bank on that!